Matt Mikas is a Sound Artist and DJ, working as a freelance scenic artist in Brooklyn, NY. He's a frequent speaker on the subject of independent media and has released or collaborated on over a half dozen records. 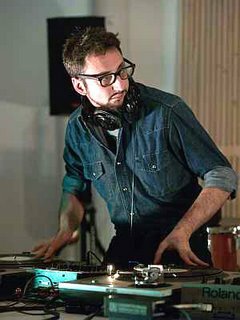 He served as Operations Manager at free103point9, a non-profit media organization devoted to transmission arts, which he co-founded with Galen Joseph-Hunter and Tom Roe, in 2002. Greg Anderson, Violet Hopkins, and Tom Roe officially started the organization in 1997 (SAR is proud to be featured on their online radio program schedule, by the way). His record, "Interactive Audio Response Kit" is two copies of the same collection of audio by the artist, intended to be played at the same time. The idea is that the sounds mingle in new ways each time the consumer participates in the re-creation of the work, by choosing where to place the needles. I guess we kind of blew it by only playing one of the records on the show, but I only have one turntable! What follows is an edit of his lengthy response to the SAR Q&A - still the longest we've posted to date! Thanks to Matt Mikas for being our featured artist this week. Be sure to also check out his amazing sculptural work HERE. *Are there any additional names used to describe this project: Depending on the type of audience and my purpose for performing and/or recording I go by either my given name of Matt Mikas or my dj moniker: KountZyr0. The more serious "sound art,” such as my Interactive Audio Response Kit, is from Matt Mikas. When I'm simply rocking a party or posting a mash-up to a message board I go by DJ KountZyr0. I have also recently formed a two member dj/mc group called The Trilateral Commission, and I am at work on curating and producing sounds and visual narrative for an upcoming comic book/vinyl record collection. For The Trilateral Commission I'm working with Arthur Arbit of the former Brooklyn based promoter team The Twisted Ones. *Tape manipulations, digital deconstructions or turntable creations: For the purposes being considered here I would consider myself essentially a "Sound Artist.” I create sonic sculptures or build several hour long experiences through an applied practice of sonic anthropology. My approach is strongly influenced by my thesis that music's sociological power is heavily based on its subtle and seductive ability to manipulate emotion, stimulate recall and ultimately influence both voluntary and involuntary reaction in audiences thereby reinforcing cultural patterns and individual egos through tactics of repetition and familiarity. I feel that music's nature is a stimulant or palliative in conjunction with its established usage as a cultural identifier through hymn and anthem as well as its common function of distraction, entertainment and one-sided narrative needs to be deconstructed through methods of improvisation, noise and the invitation of audience participation in order to restore a power balance between hierarchically placed "artists" and the consumers of their product. *Motivations: (His group, The Trilateral Commission) will be formed around the juxtaposition of seductively hypnotic and agonizingly familiar pop music samples with rhythmic spoken word diatribes expounding upon hidden histories and self empowerment. Our hope is to encourage people to change their perception of day-to-day "realities" through critical thinking and our individual and collective ability to harness the power of artwork to challenge inequitable power structures which have historically supported the brunt of popularized artwork: the state, the church and vast private wealth. *Philosophy: The Interactive Audio Response Kit is reflective of my attempt to change the way music is composed and consumed. Inspired by hip-hop and sampling I attempted to create a malleable experience which engages the listener as an arranger. The record can be played in limitless combinations by mixing the elements of both LPs together or using components in combination with other source material. By isolating vocal, rhythmic, and tonal elements I feel that I have created a truly adaptable form of music or sound art that holds the consumer in a much higher regard than most other product on the market. Further work in this module type has been produced for my personal use as dub-plates. I am currently seeking a new distribution deal in the wake of my former collective's abandonment of both myself and the principals which spawned its formation.